Blackburn Beverleys of 30 Squadron fly over Mount Kilimanjaro. My first memory of the Blackburn Beverley was I suspect similar to many others of my generation , a real sense of awe as we arrived at the new RAF Museum at Hendon to be confronted with a huge sand coloured hulk rusting quietly away in the car park. Although there were equally substantial aircraft indoors, somehow the Beverley always made the biggest impression on my young imagination. I've always felt that aircraft lose their mystique when displayed indoors, like birds in a cage I suppose, but this wonderful beast, only enclosed by the sky itself, seemed like it was just waiting for any kid like myself to hop into the cockpit, shout chocks away and soar off into the wide blue yonder! Twenty years or so later, I found myself in conversation with men who really did do that, although strangely enough they never once used the words hop or soar! We wereAt RAF Lyneham for the annual 30 Squadron Reunion and I was gathering inspiration for a painting for the next reunion which was to be themed around the Beverley. The first thing that I noticed was the great affection that these men continued to hav for this aircraft despite it's faults, many of which they took great delight in recalling! 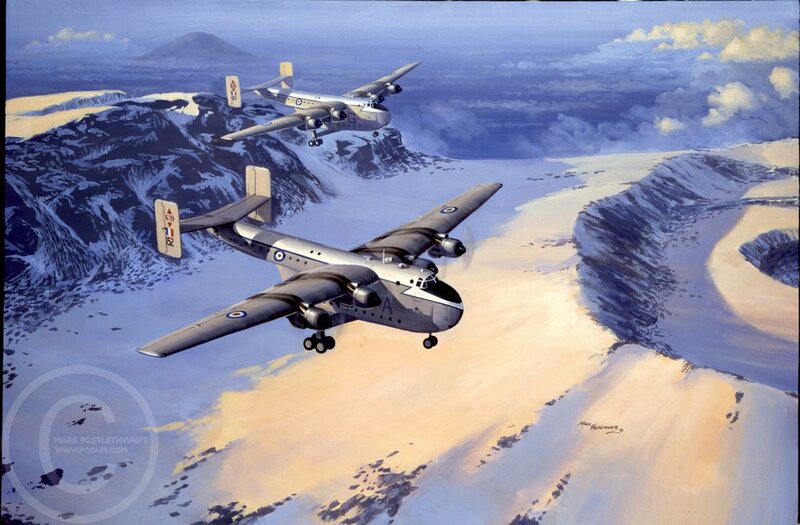 They soon agreed upon a scenario for me to paint as it seemed that every pilot on the Squadron when they were based in Africa had coaxed one of these lumbering aircraft over the summit of Kilimanjaro. Considering that the difference between the height of the mountain and the maximum ceiling of the aircraft was a matter of feet, this must have been great fun! There were tales of circling for hours as they slowly gained height, straining every rivet to get the big old bird higher and higher in the warm African air. However, what I wanted to paint was that moment when they cruised nonchanlantly over the summit , the hard work behind them, and a nice cool beer already in sight. This then is the story behind Beverleys over Kilimanjaro. Over the past few years the prints of the painting have sold steadily at airshows up and down the country. It's amazing how many people are related to someone who flew in her or jumped out of her or even just cleaned away the oil after her. They all, whatever their connection, seem to remember her with fondness and affection, what a pity that the RAF Museum now greets the youngsters of today with a plastic Spitfire and Hurricane, a sad reflection maybe, of the artificial and sanitized world in which they now live.